Gospel artiste Nathaniel Bassey is a name trending in the media for the right reason for almost 3 weeks now. His #HallelujahChallenge has not only attracted the attention of the local media but also broken through internationally. The success of the Hallelujah Challenge has made many followers wanting to know more about the convener of the praise movement. Well, here are the things to know about Nathaniel Bassey. What we have here ranged from the basics of his biography to interesting facts about him. Nathaniel was born in 1978 to a Lagos-based family from Ikot Ofon Ikono in Uyo local government area of Akwa-Ibom state, South-South Nigeria. He was born into a devout Christian home with his father, Mr E Joshua Bassey being a pastor in The Apostolic Church Bashua Assembly. He grew up with a strong passion for music, particularly the Jazz music genre, with the likes of gospel music icon, Dr Panam Percy Paul inspiring him to give it a trial. 1. Nat as he is fondly called, developed a love for both music and the gospel at an early age. According to him, He was inspired when he saw prominent Nigerian gospel music icon, Dr Panam Percy Paul in a concert several decades ago. Since then, his passion for music has grown and translated into various musical experiences. 2. Interestingly, as time passed, he developed an uncommon interest for jazz music and began listening, imitating and playing the songs of Louis Armstrong, Miles Davies, Clifford Brown, Charlie Parker, Stan Getz and Kirk Whalum, Phil Driscoll, Hugh Masekela and other jazz luminaries. 3. Nat’s zeal for the jazz stirred him to seek out bands and groups along the jazz lines. He then joined a top jazz quartet in Lagos, Spectrum 4, where he played alongside his childhood friends. 4. Nathaniel Bassey was later approached by one of the most respected figures in the Nigerian jazz and music circle, Elder Steve Rhodes to lead, arguably, the first Jazz Orchestra in the country – THE STEVE RHODES ORCHESTRA. Nat served as band leader and lead trumpeter for a period of two years before continuing with his music career. 5. His peculiar and unique soulful trumpeting style caught the ears of top entertainers and composers within and outside the country, such as Teemac, Ayo Bankole Jr, Cobhams Asuquo, Wole Oni, Yinka Davies, Adlan Cruise, Funsho Ogundipe, Peter King, Sotiris Papadopoulos, Paul Petersen, The French Cultural centre, American International School, to mention but a few individuals and organizations that sought his musical ingenuity. 6. His journey into gospel music, however, began when he started sensing a deep yearning within that there was more to his music than he thought. This led him into seeking for answers and with the mentorship and guidance of Late Pastor Eskor Mfon, the former Pastor of The Redeemed Christian Church Of God, City Of David Parish, Nat made a transition and a gospel music ministry was born. 7. Nat’s decision to go into gospel music did not go down well with many and attracted fierce criticisms from friends and colleagues who thought it was stupid to abandon what was becoming a thriving mainstream music career to serve exclusively at a local church. 8. Nathaniel Bassey spent two years at the University of Lagos where he did a little bit of Urban and Regional Planning, before gaining admission into the University of London where he studied Politics and International Relations. 9. He has attended music courses in and out of the country including the Middlesex University Summer School UK, where he studied popular music and music business. 10. Nathaniel Bassey, writes, sings and produces his own music and records with diverse groups of musicians. 11. His debut album Elohim was recorded and mixed in Cape Town, South Africa in the year 2008. It has been described as a spiritual and artistic masterpiece with the hit track “Someone’s knocking at the door” a soft-rock tune currently generating so much interest locally and internationally. 12. He is married to Serah Bassey and they are blessed with two kids. 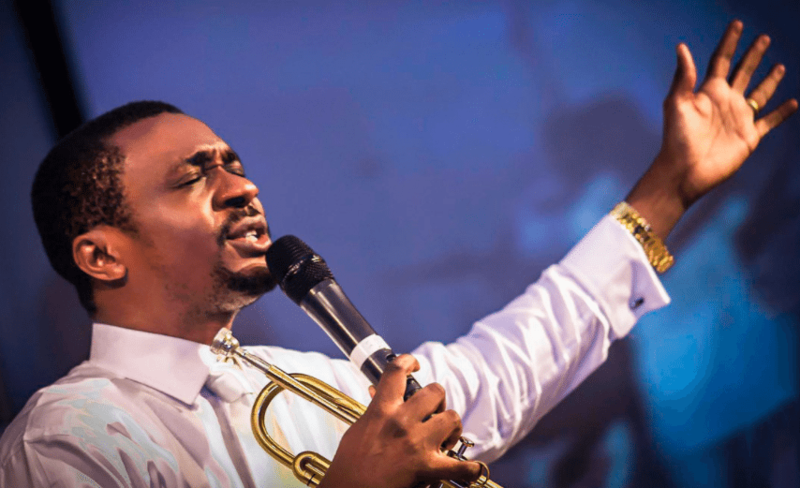 Nathaniel Bassey’s Hallelujah Challenge was an online 30-day midnight prayer and praise session. The online live gospel movement on Facebook and Instagram allowed viewers to connect from 12 am to 1 am daily throughout the month of June 2017. Thousands of people followed the online programme. As at Friday 16th June, CNN reported that about 68,000 people joined the Instagram live stream, while over 50,000 joined the Facebook live stream. Statistics from Evolve Press revealed 10,000 posts with the hashtag ‘#HallelujahChallenge’ and over 18,000 with the hashtag ‘#Olowogbogboro’ making it the number one trend in Nigeria.